MB&F’s collection of kinetic clocks, co-created with Swiss watchmaker L’Epée, could conduct their own brazen parade. It would be a procession of robots, giant spiders, army tanks, alien creatures, transformers with rocket launchers and an array of sea creatures, including an octopus. Functionally though, they are clocks—even if some double as barometers and others as hanging light fixtures. There’s an edge to them, not just in the industrial-style design, but also in character: each has an inherent element of danger, but one that’s rendered charming in the hands of MB&F and L’Epee. There’s Balthazar, a 600-component robot with red eyes and a Darth Vader-like grimace; Arachnophobia, an eight-legged, two-handed clock designed as a 3D spider with articulated legs and metal jaws; and Grant, a robot with a clock movement for a brain and tank-inspired tyres that can propel him across the rugged terrain of your desk. 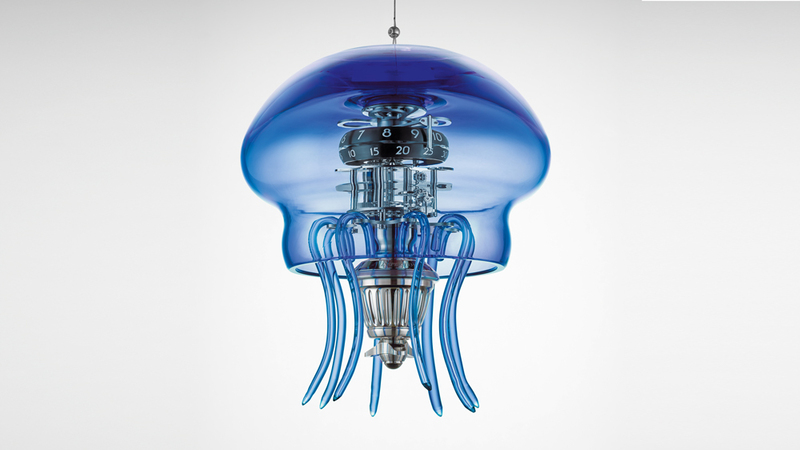 The Medusa, MB&F’s tenth collaboration with L’Epée, may be named after the mythological female gorgon with venomous snakes for hair, but it more closely resembles a harmless jellyfish, and functions as both a table clock and a hanging light fixture. The body is made of hand-blown Murano glass, through which you can read the time on two rotating disks, one for hours and the other for minutes. They’re designed to “mimic the radial symmetry of a jellyfish’s neural column”—in other words, its actual insides. The numerals are slathered with Super-LumiNova, so they glow in the dark like a real jellyfish under water. The glass body and clockworks are supported by five metal arches in table clock mode but can be removed and replaced with hanging glass protrusions that resemble jellyfish tentacles if you prefer to hang it from your ceiling. L’Epée and MB&F approached 40 different glassblowers before they found one that could execute the shape the designers were looking for. The movement took over two years to develop because, unlike previous MB&F/ L’Epée clockworks with separate points of winding and setting, the Medusa required a combined system. (The surrounding glass dome limited access to the movement.) Medusa, which can be yours for 25,500 CHF ($35,00 at current exchange) will be made in limited editions of 50 pieces in each colour: green, blue and pink.